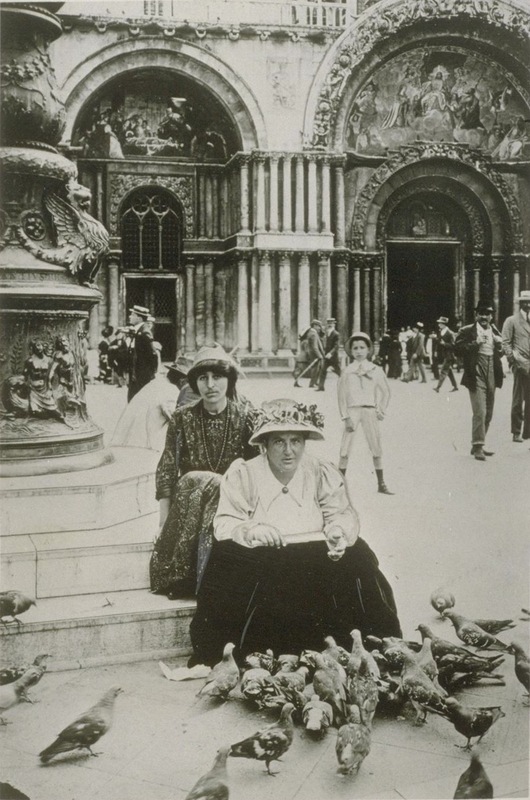 Alice B. Toklas (rear) and her lover, Gertrude Stein, in Venice, Italy, in 1908. As an elderly lady, after Stein’s death left her in relative penury, Toklas put together her recollections of life and food in The Alice B. Toklas Cook Book (Harper & Bros., 1954), the first of her two cookery books. If you don’t have this slender volume, do get one. It is a delightful read and full of delicious suggestions, as well as oddities such as a famous fudge made with hashish, which, she blithely observed, “anyone could whip up on a rainy day.” One recent recipe I tried out was a soup Toklas remembered eating in a small inn near Strasbourg on one of her wartime ambulance missions. Soup of Shallots and Cheese is spectacularly good: easy to prepare, bursting with flavour, and refreshingly economical. I’ll definitely be happy to make this one every week, especially since my husband called it “one of the best soups I’ve ever had.” Even our daughter agreed. The tureen, as you might imagine, was completely emptied by the end of our meal. 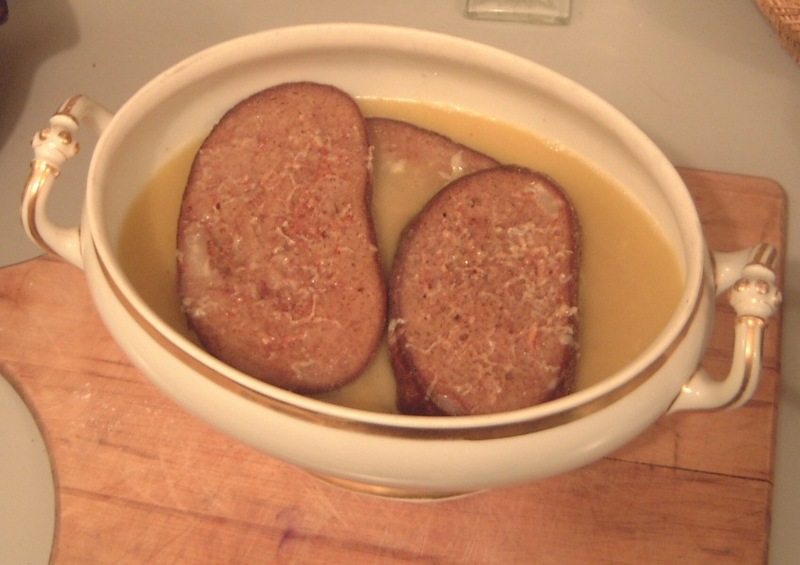 Soup with Shallots and Cheese, an Alsatian recipe praised in the pages of "The Alice B. Toklas Cook Book" (Harper & Bros., 1954). And for very good reason. The tureen is 19th-century Haviland porcelain. BLOGGER’S NOTE: The recipe is written for one serving. Merely double, triple, quadruple, et cetera, the amounts specified to increase the portions. Also I used homemade chicken stock, which we already had in the freezer, rather than the bouillon cited in the recipe. Toklas’s recipe doesn’t specify the bread to be used either; we used wheat. And since I was afraid to keep the antique tureen warm in the oven, also as directed, I just put the bread on a cookie sheet in the oven until it was required. Better safe than sorry. For each person lightly brown in butter on each side 1 slice of bread. Put in soup tureen, sprinkle with 1 tablespoon grated cheese and keep hot. Cook over low flame 4 sliced shallots in 1 tablespoon butter and add 1 teaspoon flour. Stir with wooden spoon, add 1-1/2 cups bouillon plus salt and pepper to taste and cook covered over lowest flame for 1/2 hour. Strain broth and add to it 2 tablespoons cream. Pour carefully over bread and cheese in tureen and serve hot. 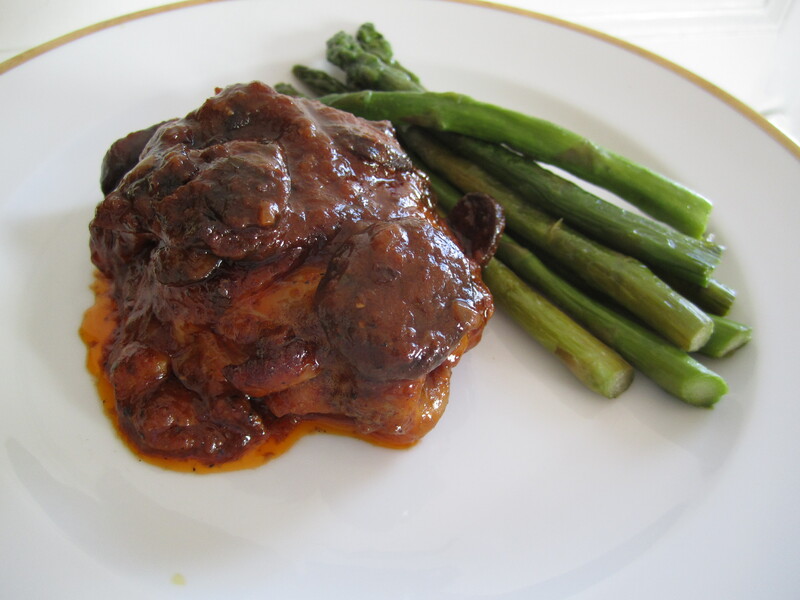 Poulet au Vinaigre, placed on an old Limoges platter. Chicken is a staple at our house. It is rustic, easy to cook, and our daughter loves it. So we typically have chicken at least twice a week—fried, roasted or sautéed. But this basic fowl can be boring, frankly. Often I crave barbecued chicken but it’s impossibly messy, staining napkins and rendering fingers sticky. 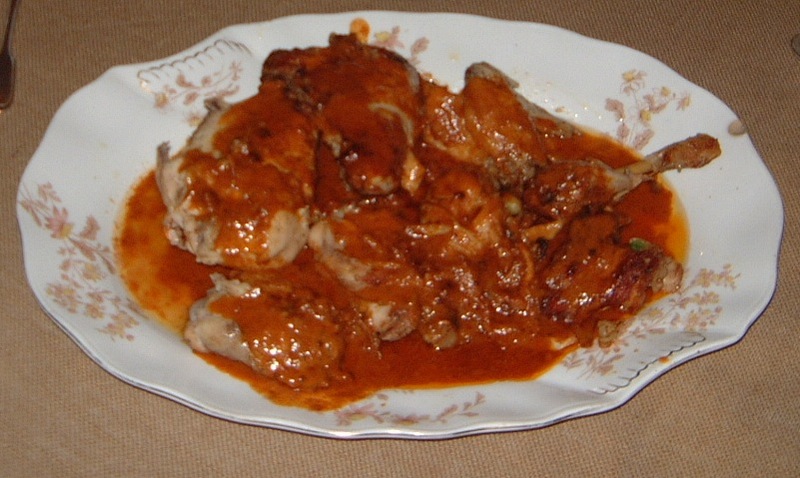 Our daughter agreed and proceeded to speedily devour both drumsticks, saying it was “the best barbecued chicken I have ever had.” As for my husband, he is sold on the splash of vinegar, which, he observed, brought “an intense dimension I didn’t expect.” He is also increasingly sold on preparing chicken in a pot on top of the stove, which cooks the meat quickly and in this instance richly caramelized the skin. Choose a chicken that is not too fat. Have it cut in pieces and cook it in a covered heavy pan with the butter and unpeeled garlic, salt, and pepper for 25 to 30 minutes, until the chicken is cooked. Meanwhile mix in a bowl the mustard, tomato purée, and white wine. When the chicken is cooked, add the vinegar. Cover the dish and cook until the chicken is almost dry. Remove the chicken and keep hot on a serving platter. Pour the mustard mixture into the pan and cook down a little without a cover. Add the cream and the Worcestershire sauce. Stir well and pour over the chicken. Serve immediately. When I think tart or quiche, creamy egg- or cream-based fillings held within a framework of flaky pastry come to mind. 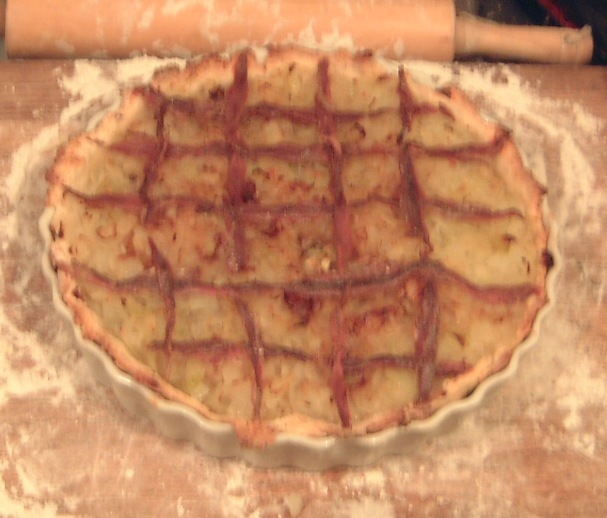 So when my husband announced a couple of nights ago he was going to make an onion tart from the pages of La Cuisine de France by Mapie de Toulouse-Lautrec (Orion, 1961), I had some inkling of what we would be dining on last night. Tarte aux oignons brestoise, or onion tart in the style of Brest—an unromantic industrial port and naval base in Brittany, in northwestern France—is like no tart I’ve ever had. (Note: A reader of this blog has pointed out that there is no such thing as a tarte in the style of Brest, however, and this recipe is a pie-size variation on the classic pissaladière of Nice, a sort of flat anchovy-and-onion pizza.) The pastry shell was in evidence, of course, and it was perfectly flaky, even though, as my husband reported, he didn’t let it chill in the refrigerator before rolling it out. “I just let it sit covered on the counter for 30 minutes,” he said. “But it worked out fine.” (He is prone to blithely ignoring recipe directions that I believe to be carved in stone.) The filling lacked any traditional binding agent such as eggs or cream. Instead it held nothing more complicated than a thick layer of chopped onions that had been cooked in a bit of olive oil until they were meltingly soft. That’s it. The surprising fillip was the topping: a couple of dozen anchovy fillets carefully and decoratively arranged into a latticework. Onion tart in the Brestoise style is earthy and rudely direct, without an ounce of artifice or gentility. 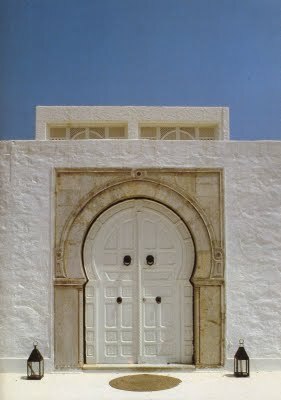 It is unsentimental, unsophisticated, and far from pretty. It is the sort of thing you would eat with a tart frisée salad and a heavy tumbler of undistinguished but tasty white table wine. Could it have been concocted by a cook with few ingredients at hand but who was under pressure to serve something warmly filling in record time? Perhaps the dockworkers of Brest and their families have better things to do than fuss around a kitchen for very long. I’m just speculating, of course. But I am certain of two things—tarte aux oignons brestoise is a bracing, soulful dish that tastily combines two harvests, one of the sea and one of the garden. Eating it makes one feel like a sea captain come home to roost. And it tastes even better warmed up for breakfast, after the salty anchovies and buttery onions have married overnight. Make the pastry of your choice, and when it is rested, roll it out to a thickness of 1/8 inch. Line a tart or pie pan but do not bake. Peel the onions and chop them very fine. Cook them gently in a covered skillet in 3 tablespoons of hot oil until tender. Do not let the onions brown. Pour the onions into the unbaked tart shell. Rinse the anchovy fillets to remove excess salt and with them make a lattice pattern over the surface of the onion-filled tart shell. Bake 15 to 20 minutes. Quiche is an extremely comforting dish. Especially on a cold winter morning following a night spent making merry with Champagne or a reasonable facsimile (Segura Viudas cava in this case). So while fat feathery snowflakes gently wafted down from a grey-white sky on this first day of the new year my husband, a bit bleary eyed, cracked open our prized copy of Mapie de Toulouse-Lautrec’s La Cuisine de France: The Modern French Cookbook, which was published in 1961 in the wake of Julia Child’s Mastering the Art of French Cooking. Based on the countess’s recipes for the French fashion magazine ELLE, where she served as food editor and became a national icon, the 763-page volume wrapped in a patriotic red, white, and blue cover doesn’t seem to have made much of an impression in the United States. Even though, as the jacket flap proclaims, it was “probably the finest and most practical modern French cookbook written for Americans.” Mrs. Child presumably had that particular audience all sewn up, though certainly Mme. de Toulouse-Lautrec and other French-food experts were eager to find a foothold in the kitchens of the New World, some more successfully than others. 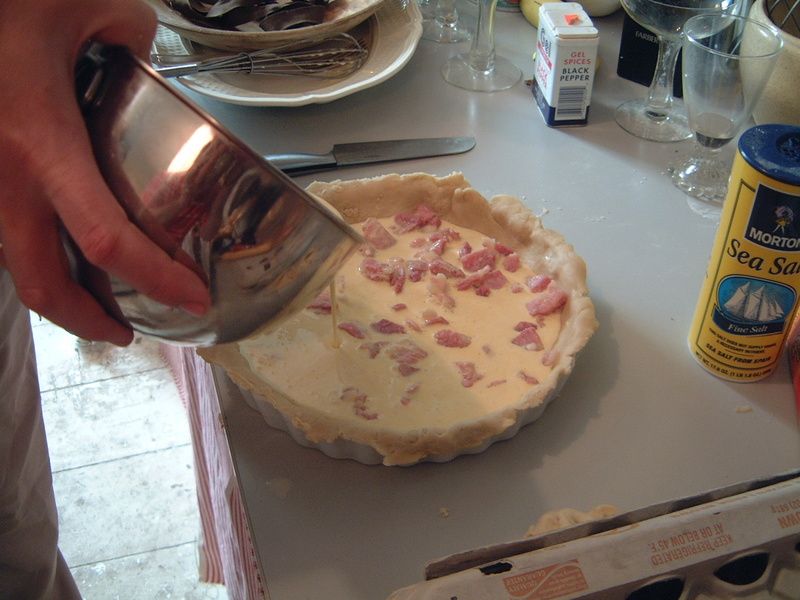 The Toulouse-Lautrec version of quiche Lorraine is the traditional version of this classic dish, which, as Julia Child explained, “‘contains heavy cream, eggs, and bacon, no cheese. '” I’ve conferred with a few French friends, and they tell me precisely the same thing: non fromage, s’il-vous-plait. Cheese became part of the recipe most people know much later in its history; ditto nutmeg. Mme. de Toulouse-Lautrec’s classic cheese-free quiche Lorraine comes out of the oven a savoury delight—fluffy, delectably rich, and wonderfully creamy, with just a hint of earthy saltiness. One slice made a lovely breakfast, washed down with a glass of perfectly chilled cava. Frankly this morning we adults needed the hair of the dog. Make a tart pastry by mixing the butter and 1/2 teaspoon of salt into the flour, adding enough water to make a stiff dough that does not stick to your fingers. If it is too soft, add more flour. Wrap in a damp cloth and let the dough rest for several hours. (It can be made a day in advance and allowed to rest for 24 hours.) 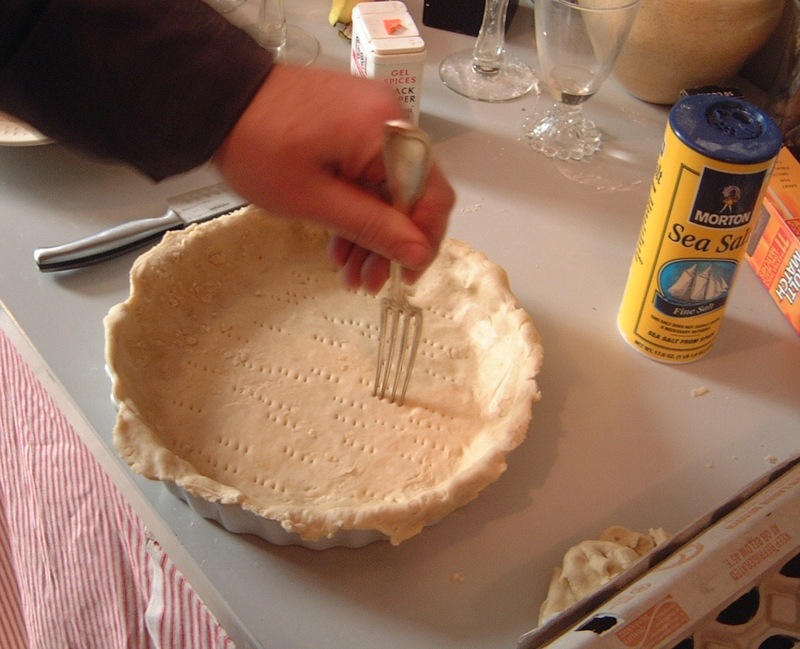 Roll it out into a circle and line the tart pan, gently pressing it into place with your fingers; trim off the excess. Prick the pastry well with a fork (see above). 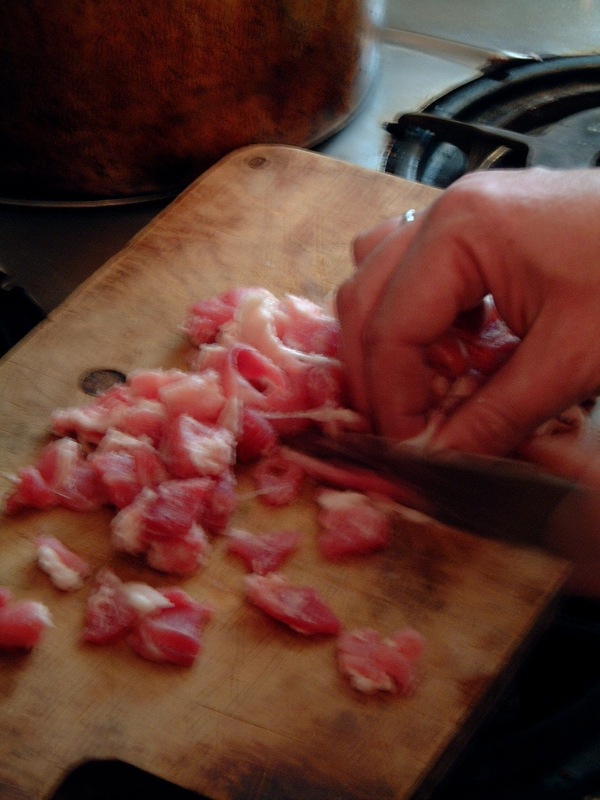 Cut the trimmed pork belly into small dice, as shown. (If necessary, substitute lean salt pork or bacon.) Put in a saucepan with two cups of water and parboil for 5 minutes. Drain and set aside. Beat the eggs until well blended. Stir in the cream and season with salt and pepper. 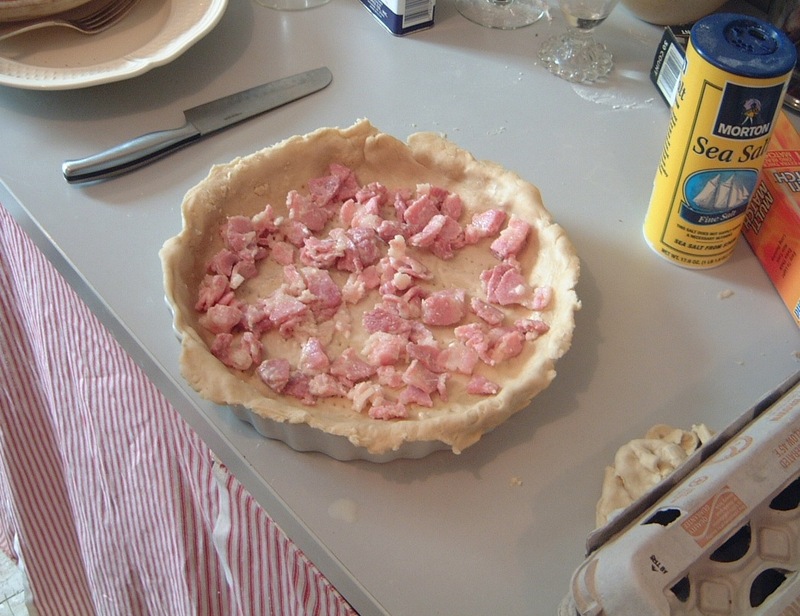 Sprinkle the diced pork belly into the empty tart shell (see above). Pour the egg mixture into the tart (see above) and bake 20 to 30 minutes. Serve immediately. 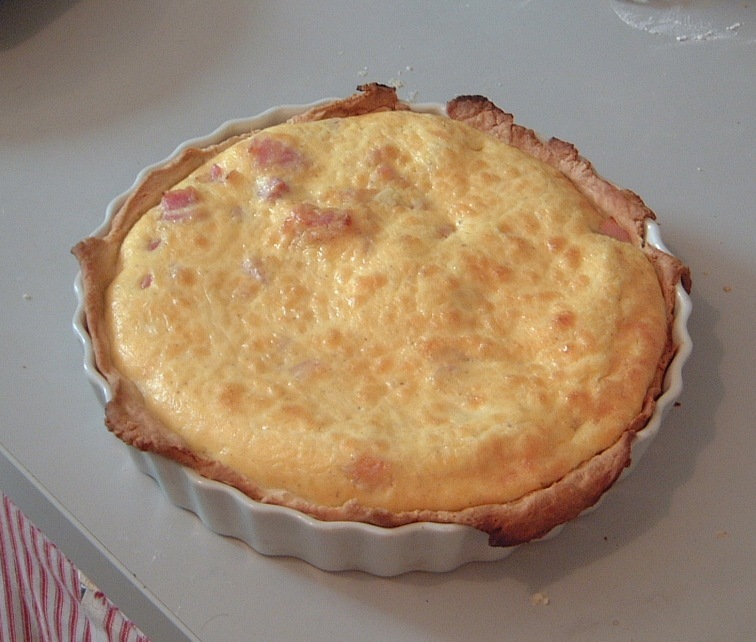 The completed quiche Lorraine, ready to be devoured.